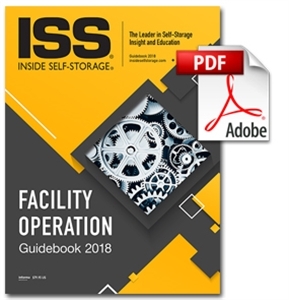 This Guidebook addresses key aspects to self-storage ownership and management providing insight to revenue, sales, legal issues, marketing, maintenance, liability, technology, security and much more. NOTE: This digital Guidebook is in PDF format. Upon completion of purchase, it will be immediately available to you in your "My On-Demand Library." If you prefer to purchase this guidebook in a softcover format, click here. To view other guidebooks in the 2018 series, click here.